If there is any topic worthy of the "gods and myths" category of Jonathan's Coffeeblog, this is it. Whereas much of the Western world appears no longer to take seriously their gods of the past, utopias in their various manifestations are more powerful in the minds of the multitudes, Western and otherwise, than ever. One might say that if the monotheistic God is dead in much of the West, Paradise and its pursuit on earth has replaced him. Consider this the tip of a very large iceberg because I will probably write about it more. 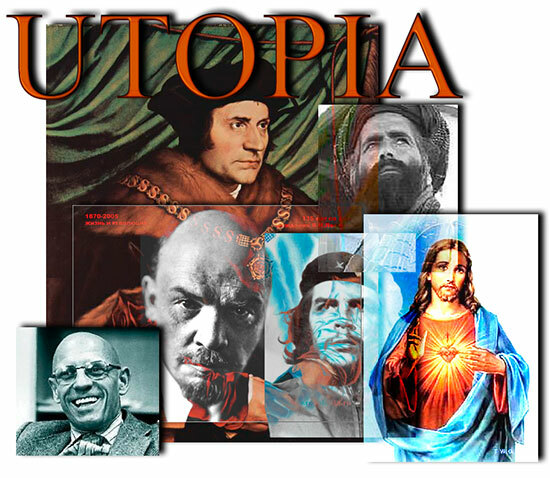 Start with utopia itself, a term derived from the Greek by English lawyer and Roman Catholic saint Thomas More, meaning "nowhere", because no utopia has ever existed. (As hipsters said in the 1950's, "Nowhere, man!") If a Paradise means a place inhabited by and created by one or more gods, a utopia is its equivalent on Earth. Most utopian ideals come from religion, including the idea of a great man who will lead the faithful to utopia. Yes, there is the Judaeo-Christian Messiah, and the Islamic Mahdi (the Twelfth Imam among some Shia), but secular movements have their own messianic myths, including Marxism's proletarian Revolution, led by Lenin, Che Guevara the t-shirt Messiah, or Marx himself. Interestingly, one of the first may have been a Zoroastrian messiah called the saoshyant. Beside messianic versions of utopia, we yearn for ecotopia, where all of earth's resources are sustainable. Closely related are social utopias: no great leaders, just great means for human cooperation. At one time, the United States of America may have been conceived as a socio-political utopia, and for some it still is. And that brings us to the idea of the dystopia, the living nightmare, the anti-utopia, which for more than a few souls is represented by corporate globalist Amerikkka, also known as the Great Satan. And of course, for the liberal-minded of our planet, a Taliban Afghanistan, where Buddhas are blown up, music and kite-flying is banned, and women are kept locked in the house, was the blueprint for dystopia. But back to the idea of utopias as "nowhere." They exist only in the human mind. (Is that true of gods too?) However, Michel Foucault, the late French philosopher who once taught here in Berkeley, wrote a 1967 essay, Des Espaces Autres, Of Other Places, where he pointed out there already exist spaces distinguished by some utopia-like qualities, being separated from the destructive features of ordinary life which seem to make the need for utopia so pressing. Foucault called such other spaces, heterotopias. In a heterotopia, Western and Taliban ideologues can co-exist without killing each other. Foucault mentioned a list of heterotopias: retirement homes, prisons, psychiatric clinics, gardens, and cemeteries, but, because it did not exist in 1967, he did not mention what has become the most important of heterotopias, the very heterotopia where Jonathan's Coffeeblog resides: cyberspace. Send the URL for this item to your Twitter Friends! "The meaning of life and other trivia." Copyright ©2004, 2005, 2006, 2007, 2008 Jonathan David Leavitt. All rights reserved. Every page now has Seesmic/Disqus video commenting. Scroll to the bottom to see or post video comments. To read a text-only version of Jonathan's Coffeeblog on your iPhone or other mobile phone, click here. Or to see the graphics with less text, click here.